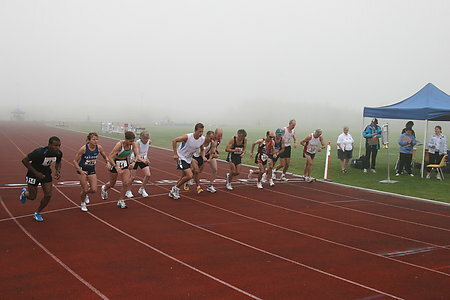 Last weekend’s Masters Championship was a great success for the SJ Track Club. We had rave reviews from all competitors, competitive success for all our club participants and a fun time for all including the volunteers. Thank you to everyone who helped out, competed and especially to our many sponsors. A special thank you to our presenting sponsors Irving Oil and the Province of New Brunswick. The Royal Canadian Legion is proud to announce the following people being selected to represent New Brunswick at the National Legion Track and Field Championships in Oromocto from August 8-14th. Congratulations to all of these fine young athletes. Last week our very own Geneviève Lalonde competed in the Czech Republic at the World Youth Track and Field Championships. Geneviève’s solid preliminary run qualified her for the final, where she clocked a personal best time of 4:30.90 for a tenth place overall finish in the Women’s 1500m event. Her time is only 1/10th off Kelsey Daley’s New Brunswick Junior record. Mike Leblanc, Joël Bourgeois, Jocelyn Ruest, Brad Robinson and Sara Miller competed in the Canadian Senior Track and Field Championships last week in Windsor, Ontario. Joël finished an impressive 2nd in the Men’s 3000m Steeplechase event on Sunday with a time of 8:51.14. There was a great turnout this past Saturday, July 14th at the NB Outdoor Championships with competitors of all ages. It was the last chance for many athletes to try to qualify for Legion Nationals in Oromocto and a great effort was put forth by all. Jennifer Bursey recorded a NB Record in the 100m Hurdles with a time of 15.71 and Barry Britt won the 1500m in 4:04.48. Last Sunday, July 8th Athletics NB hosted the Atlantic finals of the Hershey Track and Field Championships in Dieppe. Besides the 200 athletes who were registered for the meet from over 50 communities throughout the Atlantic Provinces Bruny Surin, the Olympic Gold medallist from 1996, was in attendance as one of the Hershey’s Track and Field Legends. This year, of the ten athletes who qualified from the Atlantic Provinces, eight are from New Brunswick and will represent the Atlantic Provinces in Hershey Pennsylvania from August 2nd to the 5th. Shaelyn Clark from Quispamsis, Cassidy Richards from Fredericton, Alexondra Kiely from Grand Barachois and Alyson Colpitts from Nasonworth will compete in the girls 9-10 4x100m relay. These girls won the relay at the Atlantic Final with a time of 1:04.80. Nick MacMackin from Quispamsis will run the boys 11-12 800m, and won this event in Dieppe in 2:30.40. Morgan Hawkes from Fredericton qualified in the girls 13-14 800m with a time of 2:23.4. Andre Bourgeois from Memramcook will compete in the boys 13-14 Softball Throw thanks to a qualifying distance of 225’9" at the Atlantic Final. Katie Robinson of Saint John who qualified from the Atlantic meet with a time of 1:04.6 in the 400m dash. Congratulations to those athletes, and good luck in the North American finals which will be held in Hershey Pennsylvania August 2nd to the 5th. Hershey Foods Corporation covers all expenses associated with this trip. The Hershey Youth Program has been a national event in the U.S.A. for the past 30 years. Initiated as a playground track & field meet in 1975 in Charleston, W.Va., the program has become the largest youth sports program of it's kind in North America. The program was offered on a statewide level in West Virginia in 1976, became a 10-state regional event in 1997, and was offered nationally in 1978. Meets are now held in all 50 states and all across Canada. At this year's Aileen Meagher High Performance meet Barry Britt established a new Juvenile 3000m record. His time of 8:36.06 eclipses the record set by Joël Bourgeois in 1988. Fifteen New Brunswick athletes competed at this year's meet and several achieved personal bests including: Rebecca Barton in the 400m (62.48) and 1500m (5:01.71), Alex Stuart in the 400m (55.85), Jordan Jamison in the 400m (57.02) and Jean-Marc Doiron in the 1500m (4:04.02). Complete results for the meet are available here.